Sounding like a broken record; it’s hard to believe that your Humble Scribe was last at Suzuka Circuito six years ago... As all of the talk ‘bout the impending wet stuff, nee precipitation in the form of a massive 2-inches made me flash back to that most adventurous trek to Suzuka in the most appalling conditions! 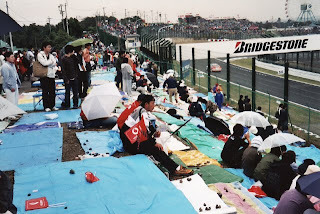 Which I laboriously scribbled ‘bout in: Suzuka, 2004. After having driven all the way from Sasebo to Suzuka – with the rain’s intensity increasing the closer we got to the track. Hey! I CANNOT see anything ahead of me – our Driver proclaimed! 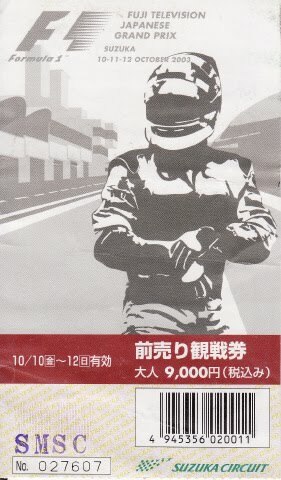 We were shocked to be told by our Super Host Yasushi: “Suzuka; NO go! Qualifying CANCELLED due to Typhoon...” WTF? As little did I know I’d be on hand for History being made two years in a row, as the year prior DER TERMINATOR, a.k.a. Michael Schumacher would clinch his record breaking sixth World Championship there, albeit with somewhat of a dubious drive, Pinballing his way home to eighth place. Whale at least Bruno’s Part time teammate Sakon Yamamoto was back alongside him... Naturally “Just-in-Time” for the Japanese GP, as the SPEED Boyz – namely David Hobbs pointed out just how overly twitchy the Hispania chassis looked Ontrack as Sakon slithered about; Aye Karumba! Whilst the most entertaining? Story of Friday’s SPEED commentary was about the Scuderia Toro Rosso Mechanic who was fired after the Singapore race for having simply mopped up Jaime Alguersuari’s water leak some 5hrs prior to the event... Before Alguersuari was forced to start from Pitlane at Singapore as the Mechanics thrashed to make repairs on said leaky radiator; OOPS! And a la Singapore, the Red Bull Duo was once again Untouchable during the first two Practice sessions, with Master ‘Zebb leading Mark Webber, followed by “The Krakow Kid” (Robert Kubica) and “Fredrico Suave.” (Alonso) While ‘JAGUAR (Hamilton) walloped the wall in FP1, ripping off his Left front suspension and causing a ‘Mega rebuild of his chassis. Which allowed him only a scant 8.5min Ontrack in the Afternoon session... But as Bob Varsha pointed out: Who was fastest in Singapore before Qualifying and the Race? Yep, Yuhs guessed it... Seb Vettel, who seemingly got dusted off by Alonso; SHEISA! Thus having awaited F1 Debrief on SPEED; what the HELL! I might as whale stay-up for Qualifying, eh? Especially since I’d like to find out Weather or NOT! They’re able to squeeze in the three ‘Qualie sessions. CRIKEYS MATES! PULL YOUR ARSES OUT AND CANCEL THE BLOODY THING! After Clyde & I both lamented last weekend how we’d like to be at Suzuka this year... I’m thinking may be it was best to not be SOAKING WET! SHEISA! I mean C’mon Uncle Bernaughty – Pull the Plug... As what a shame for those Zillions of ‘Mega Devoted Japanese Fans – Who ALL should be given a refund! So I’m guessing History will repeat itself? As Messer Buxton interviewed RBR Team Boss Christian Horner who said: “We’re ALL looking at the same weather radar picture – and it doesn’t look like it breaks ‘til 8PM.” (Saturday night) So why all of the STUPID delaying tactics Bernie... OOPS! Guess I’ve prattled on long enough ‘bout that, right? Just tell me when to reset the BLOODY ‘Ol VCR - Otay? So having scampered off to finish poondin’ out this mesmerizing story... I missed the final moments of the SPEED Qualifying Broadcast... But at 11:39PM West Coast/Seattle Time; Oh Never Mind! The Powers to be finally realized they could NOT Postpone any further what had been obvious to everyone on Pitlane. As Will Buxton chatted up his new Mate Bruno Senna during the rain delay, where Senna quipped: “With this much rain I think we’d need a hull and a propeller on the back...” (To go anywhere) So Qualifying will be held on a Sunday for the second time in F1 history, slated for 4hrs prior to race... As I have NO idea when SPEED will air this?